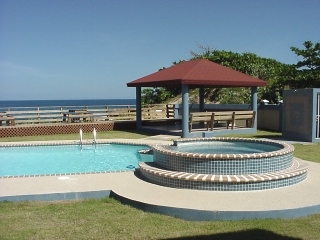 This beautiful oceanfront 2 bedroom, 1 bath condo is located in Isabela just a short walk east of popular Montones Beach. This new oceanfront condominium complex includes the use of a large swimming pool, jacuzzi-style tub, and a gazebo for entertaining guests. 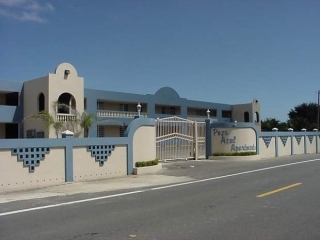 Poza Azul has easy access to the Aguadilla Airport as well as the Pta. Borinquen Golf Course. During the day and evening enjoy some of Puerto Rico's best local foods at nearby Jobos Beach. A comfortable 2 bedroom, 1 bath condo with fully equipped kitchen, air conditioning, Cable TV, DVD/CD player, telephone (cards only), assigned parking, private balcony, located overlooking a scenic beach in Isabela Puerto Rico. Rate: Sorry, there is a one month minimum stay on this property. Please call for details. This new condominium complex is located just east of popular Montones Beach in Isabela. Many of the beaches in this area are suitable for swimming and snorkeling due to the protective reefs that buffer the larger waves. Fishing is also very popular, along with admiring the varied wildlife. Sit back, relax in you own private lounge chair and enjoy the sun and surf. Watch the sea pelicans and beautiful sights each day of your stay. Enjoy the awesome sights from the comfort of the balcony and gazebo area. Many attractions are close by too. One of Puerto Rico's best Horseback Riding stables are located just a short drive to the west.